Join us back at The Walls, 5 – 8pm, for the opening of CHANNEL SURFING featuring Benjamin Forster, Anita Holtsclaw and Daniel Mudie Cunningham. Maps for self navigation can be collected from The Walls at 4/18 Mountain View Avenue Miami. The walk to view all artworks, starting and ending at The Walls, is approximately 1.5km and takes about 20 minutes, not including time to view or participate in the artworks. We suggest 1-1.5 hours to navigate the circuit, stop and view the artworks, take in the surrounding views, and to hydrate along the way at one of Rachael Bartram’s drink stations. Most of the locations can be accessed by car and there is on street parking available. DHANAMENTA is a one day offsite exhibition that spans 13 locations around THE WALLS in Miami. 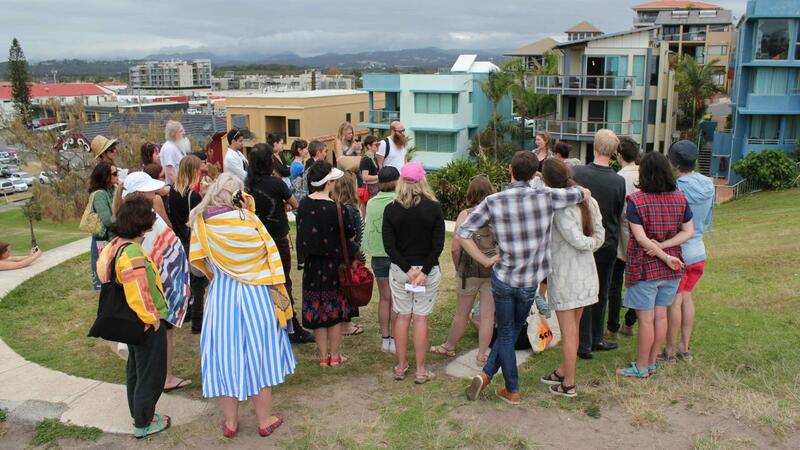 From North Burleigh down Mountain View Avenue to Ernie Tebb Park, DHANAMENTA explores the Gold Coast landscape and its natural and fabricated beauty by inviting artists to respond to and install artworks in specific sites in our postcode. DHANAMENTA is a sunny play on DOCUMENTA, the famed outdoor and site-specific survey of international contemporary art. This project is supported by The Regional Arts Development Fund. The Regional Arts Development Fund is a Queensland Government and City of Gold Coast Council partnership to support local arts and culture. DHANAMENTA 2 has received financial assistance from the Queensland Government through the Visual Arts and Craft Strategy, an initiative of the Australian, state and territory governments.